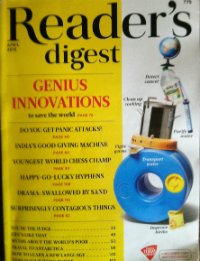 We have received our subscription copy of Reader’s Digest Magazine (India Edition – April 2015 issue before a few days. It was quite on time delivery and here are our personal reviews and views for the same. The editorial is worth reading and the message it conveys is really worth understanding (not only just reading). With the example of Bill and Melinda Gates – the philanthropists – the editor conveys that one need to be a giver, be it an idea or money. The editorial promises to burst some myths about the poor people and countries. It is often said that some countries are “basket cases” and the money spent there (for good causes) fail to generate fruitful results. Is it true? Well, the article is there to read. And yes, you can share your views on the same via comments below, of course. The reader’s reactions – are quite interesting too. One fellow confirms that after changing his password to (something inspirational) he was able to lost a few kilos of weight! The reason?! The password (or passphrase) was meant to inspired him to do so. Well, such techniques must be used in real life, as they are harmless anyway. Talking about hygiene and cleanliness is easier that really act on the same. It is something that only government cannot do, the people have to stand shoulder to shoulder for the same. There are areas in various countries where toilets are not available in every home. Or one need to use public toilets in many cases too. When using a public toilet, in addition to waiting in a queue, one major problem people face is about the hygiene. It is a fact, and almost everyone knows it, but a few one acts on the same. A woman from India and her requirement cause a nice idea to born in solving the real problems of real people living in the real world. Search articles about PeePoo (Biodegradable Toilets) and you will be able to find out a lot about the PeePoo project and Anders Wilhelmson, and his partner Camilla Wirseen, who are active people behind the same. The case of the overweight lady who met with her death due to the irresponsible behavior of airline and whether her husband’s claim is proper or not, opens a moral debate. After reading the case majority of people will think that technically the airline not responsible for her death, but the consequences it have create are actually the cause for the ill fate of the lady. What do you think about the case? You can send your views to the magazine in “Reader’s reaction” segment. It is said that Prevention is better than cure and for the same reason, you should read these two pages. Other important two pages talk about our increasing dependency on Internet, and online product reviews. Both the articles are thoughtfully written and the explores the reality. Also the “myth buster” section for travelling arena is quite interestingly written. For example it is often said “don’t eat the street food”, but actually it is cooked in front of you and is fresh in nature in most of the cases. And when you spend time sitting for hours in restaurants and hotels, you often haven’t seen the kitchen the have! 6 ways to save the world – article is not about the big problems and hypothetical solutions. It rather talk about the problems people (in specific segment) face in day-to-day life, and the solutions to the same. The article about Give India is informative. Do you like thrillers and mysteries? The article about “uncommon way to meet with death” will interest you for sure. Beyond belief – is an article about an adventure trip to Antarctica. The only soothing thing you find is the nice picture of two cute penguins. The harsh realities and the way the thing can, and often actually, go wrong there is nothing less than a thriller. Swallowed by Sand – article falls in – Real Life Drama – category. If re-instates the fact that the truth can be stranger than the fiction in many cases. And once you met with the wrong fate, only luck and the presence of mind of you and your saviours (in addition to concrete efforts, of course) can save you. How much do you think you can write about hyphen (-)? Well there is a small article about the same found in this issue, and it is quite good reading material. An article about the Rikshaw-walas is quite nicely written and more importantly studded with some of the very nice photographs. The article about – Reading Books – is a good read. Same we can say for the article about the “organ transplant” article. Our personal verdict: A magazine issue definitely worth reading.